Greek Islands Property For Sale - Crete, Mykonos, Santorini, Corfu, Paros etc..
Real Estate In Greece.net is a portal comprised of a growing network of select Greek property agents, real estate developers in Greece & owner listed Greek properties & homes for sale in Greece & the Greek Islands. You can quickly search for Crete Property and the other popular Greek Islands real estate for sale. You save time & money on your Greece property purchase by viewing a selection of villas, apartments, land, commercial real estate & houses for sale in Greece & the Greek Islands all in one place & with fast & easy search & smart user tools. Users have access to both agent, developer & owner listed Greek real estate for sale, as well as a Greek Islands travel guides & extensive information & FAQs to help you buy and sell property in Greece. We will help you quickly, affordably & effectively promote your properties & company through this site to reach new markets & clients interested in purchasing property in Greece. Search for property in Greece with RealEstate-In-Greece.net - the best place to search for real estate in Greece. From ancient ruins to sparkling seas, Greece is a stunning and diverse country with plenty of property for sale. Whether you're looking for a villa in Paros, a house in Santorini or an apartment in Athens, there is a great range or houses for sale in Greece. The site of one of the world's oldest civilisations, Greece conjures images of ancient monuments and architectural remains. Along with the iconic Acropolis in Athens, hundreds of ruins and historic sites are dotted throughout Greece - from the palace at Knossos to Akrotiri (the Pompeii of Greece). Of course, Greece is also a lush, modern and vivacious country with the bustling streets of Athens and the perfect beaches of the Cyclades Islands. You can find property in Greece anywhere from the heart of the main cities to villas overlooking the sea. Particularly popular are the many beautiful Greek Islands. From the larger islands such as Rhodes and Crete to the lesser known locations in the Dodecanese and Ionian archipelagos, there is an endless amount to discover. 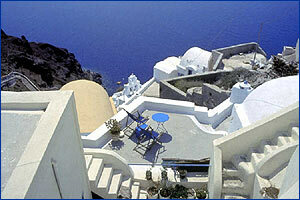 You can find property in Greece on many other these amazing paradise islands. The warm waters of the Aegean and the pristine white beaches make them the perfect places for holiday property or as a place to escape it all and relocate. The southern most of all the Greek Islands, Crete is, by far, the largest and most popular of the islands in terms of tourism numbers and international sales of Crete property. The strength of the tourist market has encouraged British buyers to rent their property in Crete whilst not enjoying use of them themselves or purchasing specifically for investment purposes. Much of the property in Crete is representative of the 4,000 years of history the island offers and can be found on beautiful landscapes, stunning beaches and in the unspoilt seaside towns and villages which are, as yet, untouched by mass tourism and overdevelopment. Real Estate in Crete is located in the 4 prefectures of the island: Chania, Lasithi, Rethymno and Heraklion. For the ultimate tranquil houses for sale in Crete, the north west of the island is an area of outstanding beauty and is the greenest part of Crete. Lush vegetation meets the coast where a scattering of villages and fishing harbours appear untouched by time! The Cyclades Islands cluster is a group of Greek Islands situated in the deep blue Aegean Sea. They are considered one of the finest vacation destinations worldwide, providing visitors with a wide range of diverse characteristics. They are composed of 39 islands of which 24 are inhabited. The Cyclades are the most famous of all Greek islands with Amorgos, Anafi, Andros, Antiparos, Delos, Ios, Kea, Kimolos, Folegandros, Milos, Mykonos, Naxos, Paros, Santorini, Serifos, Sikinos, Sifnos, Syros and Tinos . The islands are peaks of a submerged mountainous terrain, with the exception of two volcanic islands, Milos and Santorini (Thera). All Cycladic Islands share some distinctive features, such as the renowned Cycladic architecture , narrow cobblestone alleyways, fascinating archaeological, historical, religious and natural sights, quaint seaside and mountain villages and endless beaches. Each island though has several specific characteristics that make it stand out from the rest, making the islands absolutely unique, each in its own way. Here one can find vivid cosmopolitan nightlife and at the same time tranquillity and peace. Real estate and property for sale in Mykonos, Paros and Santorini are very much sought after. The Dodecanese Islans is complex of over 163 islands and islets, of which 26 are resided on. They are locatted at the extreme eastern part of Greece, at the borders of Europe and near Turkey. Property for sale in Rhodes & Patmos are among the most popular houses for sale with foreign buyers.You will find here a wonderful blend of architectural styles of eastern and western cultures. Almost every island has its Classical remains, its Crusaders Castle, and its traditional villages. These islands have much to offer to visitors and potential Greece property buyers: whitewashed houses, pristine beaches with clean,clear water, traditional villages, cosmopolitan nightlife and a large variety of real estate for sale. In this diverse group of islands you can experience the authentic Greek life without the typical tourist traps. Each island in the Ionian has a distinct character and desire -between them they offer everything one could wish for from your holiday home in the Ionian Islands. The Greek Ionian Islands are scattered off the west coast of mainland Greece. The two most popular places for houses on the Ionian Islands are property in Corfu and real estate in Kefalonia; while homes in Zakynthos and property in Lefkada are surrounded by popular holiday resorts and property in Ithaki is great for those seeking a tranquil, unspoilt island untouched by mass tourism. You can swim with the loggerhead sea turtles should you choose a property in Zakynthos, party the night away before returning to your property in Corfu or follow in the footsteps of Homer's Odysseus to find your perfect property in Ithaki. A property in Lefkada means residing in one of the top windsurfing resorts in Europe whilst property in Kefalonia puts you a stone's throw from the magnificent Myrtos Beach, widely regarded as being the loveliest in the Mediterranean.